Two Ancient Irish Gods Clash in a Brisbane Summer, as the city floods . 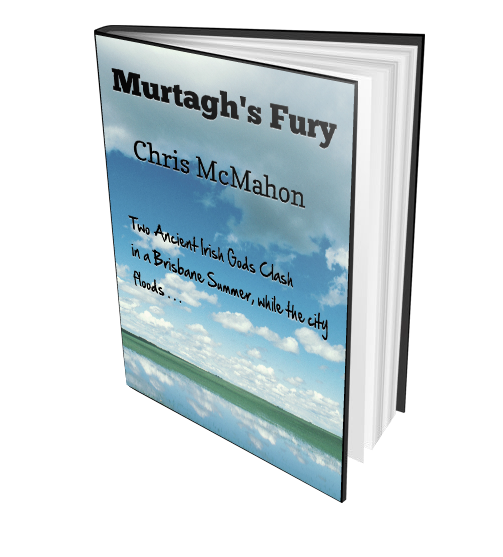 . .
Murtagh’s Fury is an exciting urban fantasy in an Australian setting, and was a winning entry in the 2005 One Book Many Brisbanes competition! Set in Brisbane in the midst of the 1974 floods, Murtagh’s Fury follows the adventures of an ancient god whose dwindling powers have trapped him in the Evans Deakin shipyards. There he battles a Fomori — an Irish giant of cunning and strife — and struggles to save the innocent people of Brisbane from another devastating wave of flooding as the tanker Robert Miller breaks its moorings and is swept downstream under the control of the Fomori, who intends to use it to block the already swollen river.